I joined Senator Andrew Dinniman (D-19) on March 16 for a press conference at Precision Polymer Products, Inc. in Pottstown to discuss Pennsylvania’s new manufacturing initiative. The topic was an initiative I sponsored called the 21st Century Manufacturing Innovation and Reinvestment Deduction Act. It was incorporated in the Tax Code (HB 542) which is now Act 43 of 2017. The measure provides an incentive to Pennsylvania manufacturers to make large-scale investments to increase or establish manufacturing capacity within the Commonwealth. It will permit manufacturers making capital investments in excess of $100 million to claim a deduction against their taxable income. The deduction will encourage businesses to invest in Pennsylvania and pave the way for the economic growth and job creation throughout the state. The provision will have no adverse fiscal impact on 2017-18 or 2018-19 budgets as the recipient has three years to make the qualified capital investment and five years to attest to the state that the project is completed. Additionally, the deduction cannot reduce the manufacturer’s tax liability by more than 50 percent. You can read more about this event here as well as coverage from the Pottstown Post and the Reading Eagle. Senator Mensch following a Capitol rally to urge passage of legislation targeting domestic violence and boosting protection for crime victims. The Senate approved a package of bills strengthening protections for victims of domestic violence on Wednesday. Six of the bills strengthen and reform Pennsylvania’s domestic violence laws, offer greater protections to victims of domestic violence and their children, and hold abusers accountable. 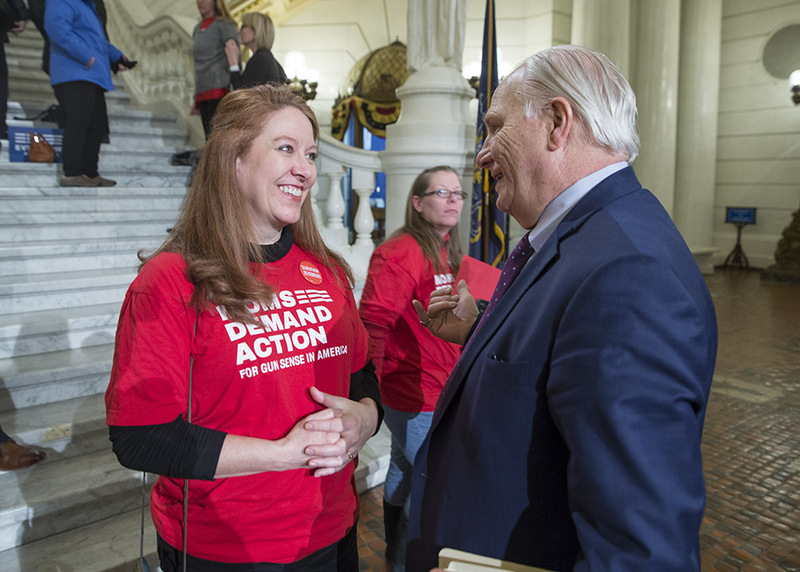 The seventh bill would establish a crime victims’ bill of rights in the Pennsylvania Constitution to protect and expand the rights of victims of violent crime. Senate Bill 501 requires a domestic violence defendant who is ordered by the court to relinquish firearms to surrender the weapons to law enforcement or a licensed dealer. Senate Bill 1011 amends the state Constitution to create a crime victims “Bill of Rights.” I am co-sponsoring this bill. Senate Bill 449 allows Magisterial District Judges to use a risk assessment tool when determining bail in domestic violence cases. House Bill 1845 designates an Indiana County bridge as the First Lieutenant Theodore P. Pytash Bridge. Senate Bill 761 would amend the state Constitution to allow gubernatorial candidates to select their running mate subsequent to the primary election, which is a process similar to how presidential candidates currently select their vice presidential running mates. A measure I sponsored to honor the life and accomplishments of physicist Stephen Hawking was unanimously adopted Tuesday by the Senate. Senate Resolution 286 recognizes the cosmologist and author as “one of the most brilliant theoretical physicists in history.” Stephen Hawking passed away March 14 in Cambridge, England. His is an amazing story. In 1963, just before his 21st birthday, Dr. Hawking was diagnosed with a motor neuron disease commonly known as Lou Gehrig’s disease or ALS. Given two years to live, he defied the odds, not only attaining his Ph.D. but also forging new roads into the understanding of the universe in the decades since. Dr. Hawking continued as a fellow at Cambridge University after his graduation and in 1979 was appointed the Lucasian Professor of Mathematics at Cambridge University, a post once held by Sir Isaac Newton. While ALS robbed him of his mobility and speech, over the course of his career, his work on the origins and structure of the universe, from the Big Bang to black holes, revolutionized the field. Stephen Hawking became an emblem of human determination and curiosity. I am grateful that the Senate acted to honor the life and accomplishments of this great man. The Senate Consumer Protection and Professional Licensure Committee and the Senate Environmental Resources and Energy Committee held a joint public hearing Tuesday to address safety and management issues of pipeline operations in Pennsylvania. The Senate Game and Fisheries Committee held a public hearing Wednesday on the annual reports from the Pennsylvania Game Commission and the Pennsylvania Fish and Boat Commission. The Senate Health and Human Services Committee approved four bills on Tuesday. On Monday, the committee held a public hearing on the nominations of Department of Human Services Acting Secretary Teresa Miller, Department of Drug and Alcohol Programs Acting Secretary Jennifer Smith and Department of Health Acting Secretary Rachel Levine. On Monday, the committee held a joint hearing with the Senate Appropriations Subcommittee on Public Safety and Criminal Justice to discuss criminal justice issues. The Senate Veterans Affairs and Emergency Preparedness Committee approved four measures on Tuesday. The Senate returns to voting session Monday at 1 p.m. On Tuesday at 2 p.m., the Senate Appropriations Committee will hold a public hearing on the proposed budgets of the Department of Health and the Department of Human Services. This budget hearing was postponed on March 7 due to inclement weather. You can watch session and the hearing live at PASenateGOP.com.